Here’s the acronym for the order of flats. Battle Ends And Down Goes Charles Father. Notice that it’s the acronym for the order of sharps backwards. 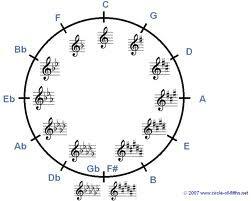 To figure out how many flats are in each flat key, let’s look at the circle of 5ths again. If you go counterclockwise around the circle and you get the flat keys – F, Bb, Eb, Ab, Db, Gb, and Cb. Note that Db can also be C#, Gb can be F#, and Cb can be B. Please don’t worry about this right now. If I ever talk about songs in the key of C# or Db, I’ll explain then. It’s not that complicated, but it would be a distraction right now. What we need to focus on now is the order of flats. This will allow you to write chord progressions in flat keys. …and here it is expanded. Here are the steps from part 11, this time for flats. Step 1: Choose a letter from the musical alphabet. I’m choosing Ab. We’re only dealing with major keys so far, so that means I’m dealing with the key of Ab major. How many flats in the key of Ab major? Find “Ab” on the circle of 5ths. Beside it, you’ll see 4 flats on the 5-line staff. What are the letter-names of these flats? Step 2: To answer that, look at the acronym for the order of flats above. Go through the order of flats to the fourth letter (because we have 4 flats in this key). That gives you Bb, Eb, Ab, and Db (Battle Ends And Down) This means that the key of Ab major scale has the following notes: Ab Bb C Db Eb F G.
Now replace the roman numerals with the Ab major scale. Now you know all the chords in the key of Ab major. You may be wondering how to play an Ab major chord on the guitar. There are plenty of ways as it turns out, but the most popular way is with a barre chord. Here’s a site that helps with that.